I support the statements issued so far by the leadership bodies of the Iglesia Filipina Independiente (IFI), the United Church of Christ in the Philippines (UCCP) and the Rural Missionaries of the Philippines (RMP). I join them in expressing concern over misleading and maligning efforts to label their churches, leaders and IFI Bishop Antonio Ablon as elements of the New People’s Army in Mindanao. 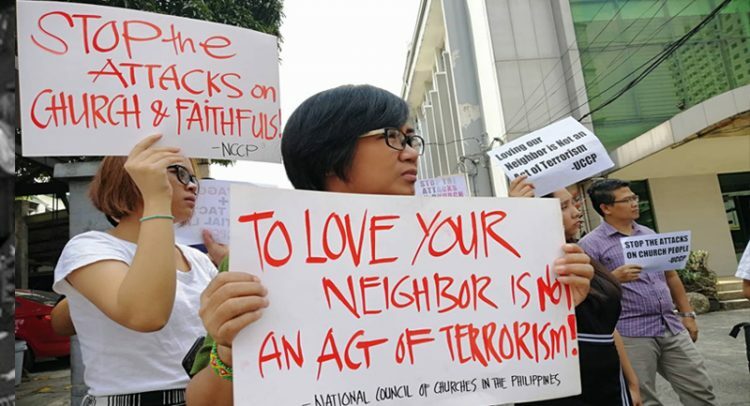 While labelling churches and church leaders as something they are not is not new in the Philippines, the context in which they are made are during situations of social unrest and repression, when the church affirms its stand. This stand is in solidarity with the vulnerable, by telling the truth about violence, oppression and the absence of peace and justice. This stand tells the truth about those who work for peace as against those who perpetuate social crisis and peace that does not last. This is a stand of hope and for hope. It is a stand grounded deeply upon faith in Jesus Christ, who has and will continue to “set at liberty those who are oppressed and proclaim the acceptable year of our Lord” (Luke 4.18-19). To transform unjust structures in this country is to affirm human dignity. It shuns violence. It shuns labelling and does not resort to arms as the ultimate solution. Rather, it promotes a situation where the roots of injustice are identified properly and resolved reasonably. Paul reminds us to be “strong in the Lord and in the strength of his might. . . for we are not contending against flesh and blood, but against principalities, against powers, against world rulers of this present darkness, against the spiritual hosts of wickedness in the heavenly places” (Eph 6.10-12). Stop the labelling! Stop the violence! Address the roots of the conflict! I pray that we be transformed by the renewal of our minds to prove God’s will, what is good and acceptable and perfect (cf. Romans 12.2).